WABCO Acquires MICO Incorporated To Grow Its Global Off-Highway Business; Plans To Build On World-Class Engineering And Manufacturing Capabilities | MICO, Inc.
Home » About » Press Releases » 02/02/2016 - WABCO Acquires MICO Inc.
BRUSSELS, Belgium, February 2, 2016 – WABCO (NYSE: WBC), a leading innovator and global supplier of technologies that improve the safety and efficiency of commercial vehicles, today announced that it is expanding its global business by acquiring MICO Incorporated ("MICO"), a global market leader in hydraulic components, controls and brake systems for heavy-duty, off-highway vehicles in agriculture, construction, mining and similar industries. MICO generated revenues of approximately $52 million in 2015 and is headquartered in North Mankato, Minnesota (USA). A long-time industry leader in pneumatic braking systems, WABCO is expanding its product offerings through the acquisition to become the first and only supplier with a portfolio of complete pneumatic and hydraulic braking and control systems for off-highway vehicles worldwide. In addition to this unique offering, the acquisition harnesses powerful synergies between technology leaders WABCO and MICO. WABCO’s strong global presence provides increased access to growth markets and customers worldwide for MICO products. In return, WABCO gains improved access to the off-highway market in North America while expanding its operational footprint in the region. Both companies will also be able to build on demonstrated world-class engineering and manufacturing capabilities. "We are excited to welcome our MICO colleagues to the WABCO family," said Jon Morrison, WABCO President, Americas. "We are committed to growing our off-highway business worldwide and to strengthen our presence in North America. MICO is key to our growth and expansion. Over the past 70 years, the team at MICO has done a tremendous job of developing world-class products and engineering and manufacturing capabilities. We are honored and excited to be taking the next steps with them." "We are thrilled to join WABCO, a technology leader in the commercial vehicle industry that is known and respected worldwide," said Brent McGrath, MICO President. "This acquisition presents exciting new opportunities for MICO, our customers, and our employees. We look forward to working with our new colleagues to leverage our respective strengths to better serve customers in the off-highway industry. Together, we are ready to enhance MICO's long-term competitiveness, innovation and growth." In addition to the headquarters location in North Mankato, MICO maintains two locations in the United States and one each in Mexico and the United Kingdom. The company has approximately 260 employees. MICO was previously privately owned and operated. Press photo / caption: WABCO acquired MICO Incorporated ("MICO"), a global market leader in hydraulic braking and control systems for heavy-duty, off-highway vehicles. The acquisition enables WABCO to become the first and only supplier with a portfolio of complete pneumatic and hydraulic brake control systems for off-highway vehicles worldwide. 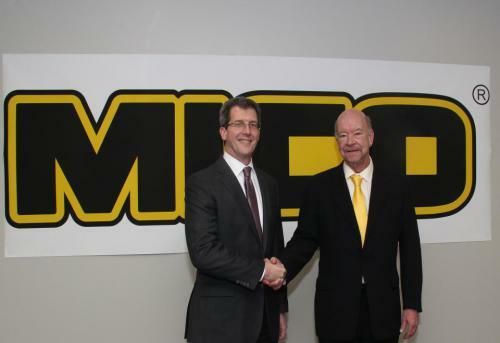 Pictured here are Jon Morrison (left), WABCO President, Americas, and Brent McGrath, MICO President, after WABCO acquired MICO. WABCO (NYSE: WBC) is a leading innovator and global supplier of technologies that improve the safety and efficiency of commercial vehicles. Founded nearly 150 years ago, WABCO continues to pioneer breakthrough products and systems for braking, stability, suspension, transmission automation, and aerodynamics. Today, all of the world's leading truck, bus and trailer manufacturers have WABCO technologies onboard. In addition, WABCO provides the industry with advanced fleet management solutions and aftermarket services. WABCO reported sales of $2.9 billion in 2014. The company is headquartered in Brussels, Belgium, and has 11,000 employees worldwide. For more information, visit www.wabco-auto.com. Since 1946, MICO Incorporated, a WABCO company, has been on the leading edge of technological innovation in hydraulic components, controls and brake systems primarily for heavy-duty, off-road commercial and industrial applications. Today, the company is a completely integrated design, manufacturing and sales operation. Its knowledge of brake system design in conjunction with state-of-the-art machinery and manufacturing processes makes it an industry leader worldwide. For more information, visit www.mico.com.